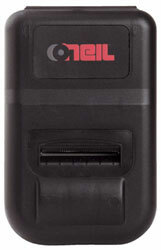 The O'Neil microFlash 2i has been discontinued. No direct replacement is available. As the world's most popular portable, rugged printer, the microFlash 2i quickly prints both standard receipts, barcoded receipts. As the world's most popular portable, rugged printer, the microFlash 2i quickly prints both standard receipts, barcoded receipts. It is so small, light and durable, it can be easily taken anywhere when hooked to the belt of your field representative. It activates when the computer sends data and goes back to sleep automatically after the transaction, saving battery life. In addition, thanks to the printer's internal memory buffer, you never have to wait for a receipt to finish printing before performing other tasks. 2" Dot Matrix, IrDA, Serial, with swivel belt clip.